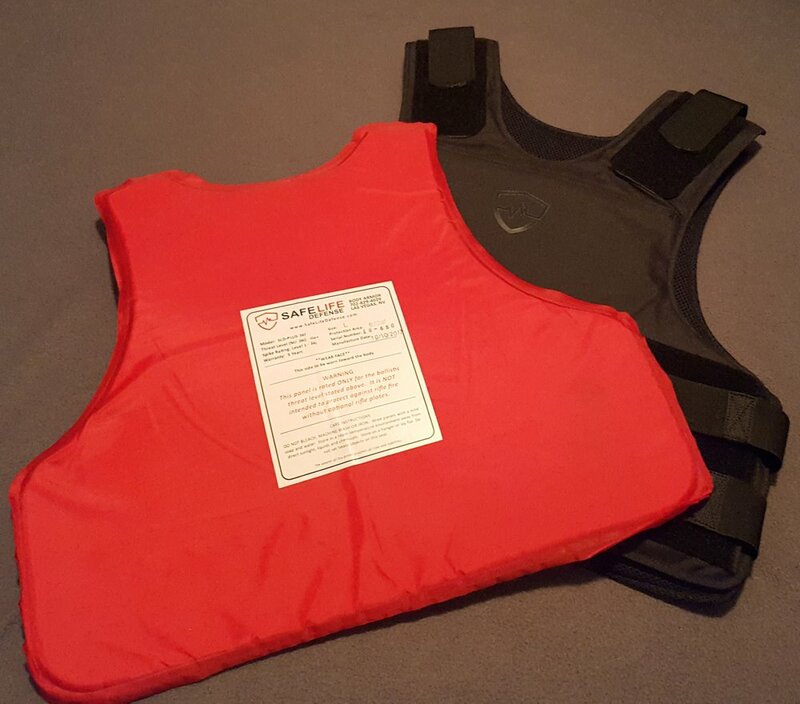 Safe LIfe Defense contacted me to see if I would review some of their soft body armor. Of course the answer was an astounding YES. Safe LIfe did supply the armor for free. Safe Life Defense has a bunch of different styles of carriers and armor combinations. Their website has a wealth of information on protection levels, care, and other questions one might have on body armor. The one reviewed here is the Concealable Enhanced Multi-threat level IIIa+ vest. What do you do when you first receive a vest, try it on of course. I immediately noticed the comfort. The mesh style liner that Safe Life uses is actually very comfortable. It even kind of slides around over a T-shirt. This helps to not pull up an undershirt or whatever the armor is worn over. The vest also has 6 “comfort straps” that use hook & loop, with elastic between each end, to adjust each side and the top for fit and comfort. One strap for each shoulder adjustment, and two on each side. I have a bit of a belly, and this vest adjusted and fit very well. I did notice that when I crouch down that the vest did tend to rise up a little, but I think this is pretty common. If you are concealed carrying IWB, the vest does get in the way of the draw. I think practice drawing your firearm, should remedy this. Some of this may be due to the fact that the sides of the vest wrap around your sides. 15% more protection than other vests, according to Safe Life. If someone were to ask me about comfort, I’d give it a thumbs up. I proceeded to disassemble the vest. The outer shell is made from a ripstop polyester and has proven to take a beating from being shot at. The seams won’t let you down either. We put a few rounds through the edge seams, then I tried to unravel them and pull them apart. Well, that didn’t work for me. So don’t worry about the seams coming unravelled and the inner panel falling out. The inner panel is where all the magic happens. This is the ballistic portion of the vest. It is constructed of a red color outer fabric with the Kevlar sheets inside. The ballistic panel is about ½”-¾” thick. The seams of the panel are welded together. The outer layer of the ballistic panel is also constructed of a ripstop fabric. This helps aid in the fabric not coming apart when the vest is stabbed or shot. When shooting at the vest, we did have a .357 round blow out about an inch of the ballistic panel seam, but it stopped the round and didn’t cause the vest anymore damage. The shot was also very close to the edge of the panel. After shooting the vest, I then tore into the inside. Inside the red fabric are super thin sheets of kevlar, stacked one on top of each other. How many, I don’t know, but it works. Also inside the panel is a piece of some sort of foam. This is the side that goes up against your body. This has to be for comfort and also to help ease the sting a little if one were to actually get shot while wearing the vest. The vest does use a different front and rear panel size, so you won’t be able to move the rear panel to the front, I tried! These panels fit inside the carrier by way of a low profile hook & loop seam/flap. Another nice feature is the ability to put rifle/hard armor plates into the front and rear outer plate pockets on the carrier. These also use a hook & loop closure to keep them closed up. I really like the construction of this vest. Through all the testing, it held up remarkably well. Now I will get into the vests stopping ability, or at least what we threw at it. I made a wood backed target stand, installed a USPSA target on it, then placed the vest over the target. I am just going to list what we shot the vest with, and then what was stopped by it, all were shot at 10yards. Shot through seam, this might hurt. I didn’t expect the vest to stop the 17hmr, 30 carbine, or the 300 blk, but we tried anyhow. The vest was also shot multiple times with all the “stopped” cartridges without any of them going through the kevlar. Some of the more potent cartridges did leave a small dent in the wood target backing, mainly the 357 magnum and 12 gauge slug. Since the vest is also rated for some stab protection, I tried stabbing it with a spire point knife. I wasn’t able to stab through the kevlar. Everyone that helped me test the armor was pleased with the outcome. In my opinion, I would trust wearing it with my life, at least for what it is rated. Plus, if you actually get shot while wearing this armor, Safe Life will replace it free, as long as it is in it’s 5 year lifespan. Speaking of lifespan, there is a manufacture date on the ballistic panel, and Safe Life rates the armor to be good 5 years from that date. The 5 year date is pretty standard for soft body armor. If you need or want soft body armor, look into the team at Safe Life Defense. I was thrilled at the opportunity to see what this IIIa+ armor could do, and it didn’t let me down. If you can ever get the chance to see or shoot body armor yourself, do it. It really gives a person a better idea of what armor actually will stop.